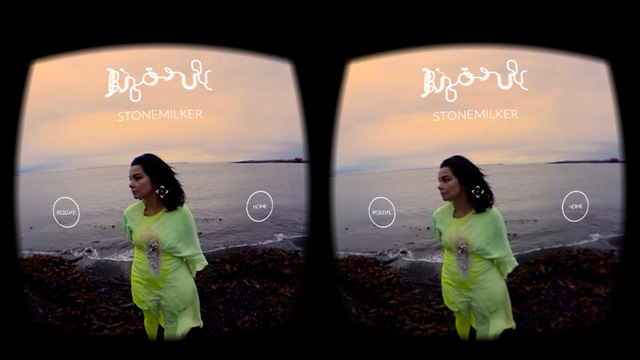 Björk is no stranger to offering unusual experiences to her fans so the new Stonemilker VR iOS app doesn’t feel out of the ordinary for the Icelandic star. The 360 degree video, which was filmed where the song was written in Iceland, can be viewed either as a ‘magic window’ or using any iPhone 5 or iPhone 6-compatible virtual reality glasses. That’s Cardboard, Freefly or VR One in this instance. The video for the Stonemilker track was shot back in November last year and the VR experience was debuted at Björk’s career retrospective show at New York’s MoMA. It was then released on YouTube to a wider audience, where you can get a feel for the experience you get from the app, of Björk walking around you on an Icelandic beach. Björk is not the first musician to use VR, with the likes of U2 creating a special experience in partnership with Apple Music as part of their October tour. Indeed, music really does look like one of the best places to deploy these kinds of interactive shows. But, although the track is beautiful and the experience impressive, it feels like VR headset owners that are also huge Björk fans is a rather niche group. It’ll cost you $2.99 if you want to try the app out with or without a headset.